The online brokerage industry is no stranger to change. In fact, it was born from it. When “online” trading first came onto the scene in Canada just over 20 years ago, dial-up, DOS and CRT monitors were all the rage, the internet was just getting its footing and the concept of do-it-yourself trading seemed to be on the cutting edge of technology. Since then, however, the technological arms race in the Canadian financial services industry has been accelerating, largely to keep pace with technologies that surround the consumers that use financial services such as online brokerages. The rapid spread of social media, mobile technology, faster computer chips and more reliable internet have posed an interesting challenge to financial services providers, including Canadian online brokerages, namely how best to keep up? For a “behind the screens” look at how Canadian online brokerages are approaching this brave new digital world, we spoke to Canada’s largest bank-owned online brokerage, TD Direct Investing. Specifically, we chatted with Richard Wilks, Associate Vice President Self Directed and Advised Client Digital Capabilities, about his perspective on what it takes to run the online direct investing operation as well as how TD Direct Investing can successfully navigate the digital landscape going forward. With an extensive background working with online investing at TD, Wilks has seen many changes take place. Granted, technology is moving more quickly than when TD’s first discount brokerage offering (aka Green Line) hit the market in the early 80’s, however rather than chasing fads, Wilks believes in taking a more calculated and measured approach to the quickly evolving online investing world. While we had a fascinating discussion about how things work behind the scenes at TD Direct Investing (TDDI), there were three important themes as to how TDDI can adapt to the new digital realities of online investing. One of the key themes Wilks stated was the importance of shifting to an agile approach to feature development. Many fintech and tech startups rely on the agile approach to building software or web apps because the aim isn’t necessarily to launch a perfect product out of the gate, but rather to launch a viable one and optimize over time. In this way, features come to market faster and can be improved upon by getting user feedback. For example, when making enhancements to their watchlist, the TDDI development team was able to quickly gather feedback on where to improve and push out additional modifications within a few months. Of course, being a financial services provider, the standard of what can go out the door is significantly high. There are considerations for security, compatibility and compliance that require additional effort and testing to ensure features are working correctly before anything gets released. Another, more strategic reason to transition to the agile approach, is to be able to be nimble enough to respond if a big tech player decided to enter the wealth management space. There are already signs these moves are being made in the payment technologies arena, so it is not inconceivable that another tech firm might decide to compete in the online investing space in the not too distant future. The move to an agile approach also helps to position TDDI relative to startup fintech firms and new entrants to the wealth management space such as robo-advisors. A second important theme that emerged was the importance of being able to listen to client feedback. For TDDI there are a number of different channels that they use to collect client feedback. 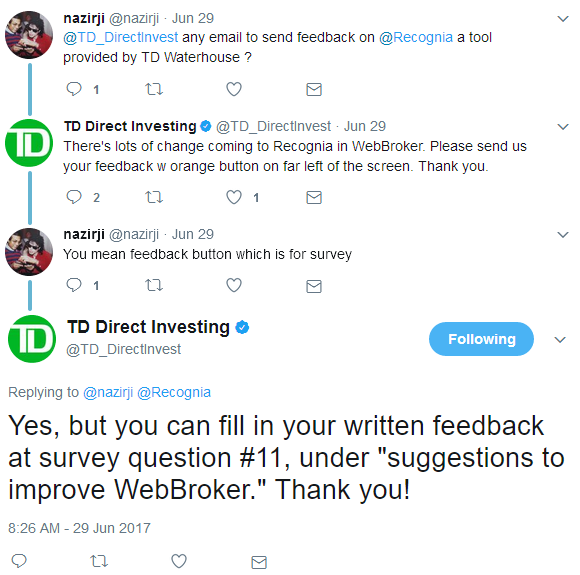 From the TDDI website, WebBroker (the flagship platform), the TD Helps forum, emails, social media as well as via client service reps, TDDI’s large user base can readily contribute feedback about a particular product. That feedback is then passed through to a TDDI team who discusses and decides which features can be rolled out and what the development cycle will be like for each. For a sense of scale, an average month can see between 300 to 400 feedback requests. 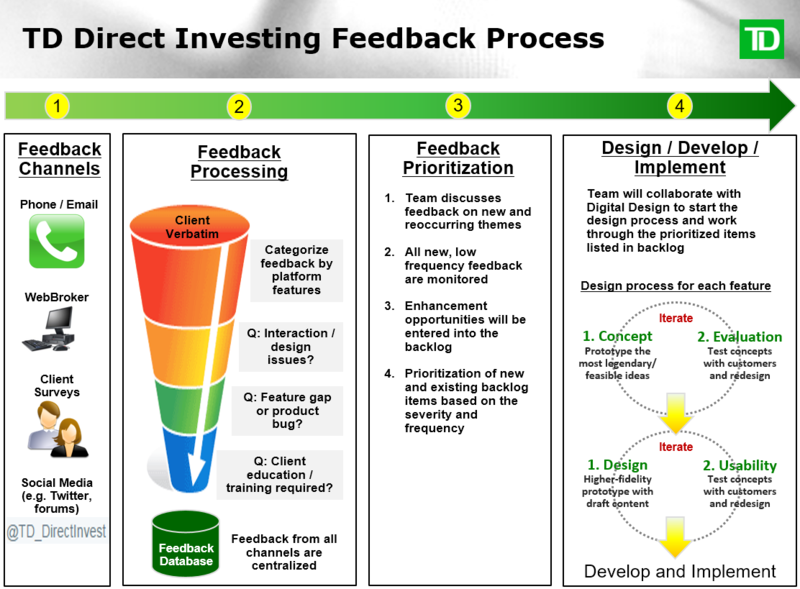 The graphic below provides an illustration of how TD Direct Investing is able to gather feedback and ultimately translate it into a feature release. Client feedback isn’t the only catalyst for product enhancements, however. It was fascinating to learn that other factors influence feature developments including regulatory requirements as well as vision and strategy. Clearly, a balance needs to be struck between sometimes competing priorities and what is in the spotlight or trending among DIY investors. 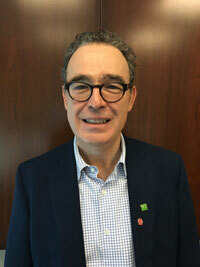 The third theme TD Direct Investing is focusing on is the shift towards mobile. Previously, development of online features and platforms required retrofitting a desktop user experience into a mobile one. For the foreseeable future, however, it is clear that mobile will dominate and a much more effective approach is to start with the mobile user in mind and then augment functionality from there. While many active traders are content with the desktop interface and additional screen real estate, the reality is that certain online brokerages in the US, such as Robinhood, have proven that younger users can and will use mobile-only platforms or apps to perform trades, check their accounts or portfolios and research potential investing opportunities. This supports the reasoning that mobile will continue to be an important platform to build around and it is a safe bet that TDDI’s possible future client base will be looking to mobile experience as a determining factor for client satisfaction. While each of these different components represents a significant evolution in the ability of TD Direct Investing to prepare for and respond to the changing needs of its users, one component that cannot be ignored is stability. With the increasing complexity of different technology integrations (for example data feeds from multiple exchanges, research tools and order execution) underpinning the trading experience, there is also the increased risk of things not working. A scan of Twitter comments over the past year will indicate a handful of times when outages have occurred during trading hours at various Canadian online brokerages – something that users are acutely sensitive to. The good news for TDDI users is that there has been extensive investment in the stability of their technology architecture. In fact, TDDI has a specific nerve-centre that tracks issues as they arise in real-time and consists of a dedicated team monitoring the integrity of the trading platform, servers and network. So, while outages or disruptions may not be entirely eliminated, response time to issues is improved and the impact of disruptions can be minimized. According to Wilks, there is a “laser-like focus” on ensuring that uptime is maximized which has helped enable TD Direct Investing’s trading platform to achieve an uptime rating of 99.6%. Innovation in the financial world is somewhat of a double-edged sword. On the one hand, consumers want user-friendly interfaces to manage their wealth. Robo-advisors, for example, have managed to gain a foothold in the wealth management space largely by offering a much more thoughtful user experience when it comes to managing a portfolio. On the other hand, finance is also about predictability, familiarity and certainty. At the end of the day technology and platforms have to work, they have to be secure and they have to deliver on what the end user needs and wants from the service. With several decades worth of experience in the Canadian online brokerage game under their belts, it’s clear to TDDI’s team that while no one is able to predict the next big change, TDDI is equipped to respond once it shows up. That said, the best way to get in front of big changes starts by listening to what customers are talking about. While many DIY investors will never know about the behind-the-scenes efforts that go into the planning, execution and maintenance of their trading platforms, the reality is that, after commission pricing, choosing an online brokerage will be heavily influenced by how stable and innovative the trading experience is. The good news for TD Direct Investing and Wilks’ team is that TDDI’s clients are increasingly happy.